Scream: The TV Series is an American 60 minute scripted mystery television series, which kicked off on June 30, 2015, on MTV and is broadcast every Tuesday at 21:00. The show is currently in its 2nd season. MTV has officially confirmed the renewal of Scream: The TV Series for Season 3. The exact release date is yet to be announced so far. Sign up to track it down. MTV and Dimension TV today announced new roles and casting for "Scream" the TV series which begins production this Monday in Atlanta. Keke Palmer will portray Kym, a rebel with a thousand causes, who is a bold and beautiful social activist with a big heart and zero patience for suffering fools. When Kym and her friends find themselves hunted by a killer, she works to flip the script and survive at any cost. RJ Cyler will portray Deion. A star running back for the high school football team, Deion hopes to secure a college football scholarship that will take him far away from Atlanta, a plan that seems destined to fail when he becomes the target of a masked killer with ties to his past. Someone knows Deion's darkest secret... and they'll use it to destroy him. Giorgia Whigham will portray Beth. Caustic and darkly funny, Beth is the resident Goth girl and a local tattoo artist. As an unapologetic fan of horror films, Beth is outspoken about her encyclopedic knowledge of movie murder... which is sure to come in handy with a killer on the loose. Giullian Yao Gioiello portrays Manny who is openly gay and loyal to a fault. Usually the smartest person in the room, he's destined to achieve great things. But his wits are put to the test when he suddenly finds himself in the crosshairs of a killer... which makes his simple goal of surviving high school and moving on with his life seem impossible. NEW YORK, NY (August 16, 2018) - MTV, together with Queen Latifah's Flavor Unit Entertainment, today announced that Academy Award and Golden Globe nominee, Grammy Award(R)-winning artist and philanthropist, Mary J. Blige, will appear in MTV's "Scream" later this year. She joins the previously announced all-star cast including Keke Palmer, Tyler Posey, Tyga, Giorgia Whigham, Jessica Sula, RJ Cyler, C.J. Wallace and Giullian Yao Gioiello. The news comes as the network just closed four consecutive quarters of YoY prime ratings growth - its best streak in seven years- and ranks as the fastest growing network in prime among Top 40 networks across all of television. 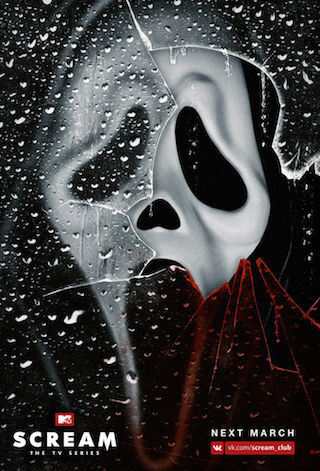 Set against the vibrant backdrop of Atlanta, "Scream" features a brand-new cast of characters destined to fall prey to the mysterious killer known as "Ghostface." The series centers on Deion Elliot, a local star football running back, whose tragic past comes back to haunt him and threaten his hard-earned plans for the future... and the lives of his unlikely group of friends. Blige plays Deion's mother, Sherry Elliot.